The president of SIPTU said it was “honouring its commitment” to its members. 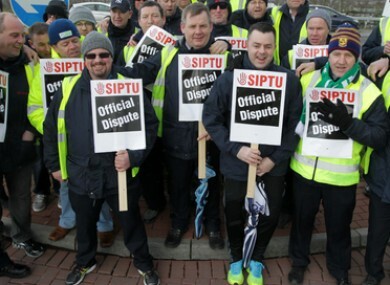 File photo of striking Siptu workers. SIPTU HAS AUTHORISED ballots by union members for industrial and strike action on public service pay. In a statement issued by their executive council this evening, the union said it had accepted difficult pay deals made during the recession but said it was now time to seek an increase in wages. The statement read: “Throughout the very difficult years since the economic collapse of 2008 the National Executive Council (NEC) of SIPTU has recommended acceptance of extremely difficult choices in both the industrial and political arena across the private and the public service. We always made it clear that when circumstances changed we would take whatever action was necessary to re-take lost ground. “We have decided today to authorise each recognised negotiating group of the union’s members in the Public Service to conduct ballots seeking mandates for industrial action and/or strike action in pursuit of better terms. This morning, SIPTU president Jack O’Connor said that the union are seeking increases in pay in line with the increased output of the country. Speaking on RTÉ’s Morning Ireland, he said that the union had committed to “supporting workers” in claiming pay restoration when the economy improved. “This current executive council (of SIPTU) recommended a strategy on the industrial and indeed the political side that was most unpalatable during some of the most difficult days in the history of our country,” he said. We always made it clear that when things improved that we would support workers mobilising and taking industrial action and strike action to recover the ground they had lost. O’Connor said that today was the last meeting of the current executive council and that its members were “most anxious to ensure” that they were leaving the council honouring the commitment to support the workers. Email “SIPTU has authorised its 60,000 members to ballot on industrial and strike action”. Feedback on “SIPTU has authorised its 60,000 members to ballot on industrial and strike action”.